Gold Rates in 2015 - Long-term Forecasts & Predictions about future of gold price. CNBCE - It hasn't been a great couple of years to be a gold bug. 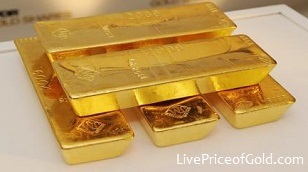 Since peaking at $1,923.70 per troy ounce in September 2011, gold has lost nearly 40 percent of its value. And while gold hasn't dropped dramatically this year, it has failed to gain back. But according to George Gero of RBC Capital Markets, the bullion trade is set to turn around in 2015. "The decline from the $1,900s down to the $1,150s is a major decline, and it was reflected by all the funds fleeing gold and running into better-performing assets, whether it's equities or debt, and that's been continuing," Gero said Tuesday on CNBC's "Futures Now." In 2014, gold hasn't been helped by the dollar's rally. The greenback has shown serious strength against other currencies, which has reduced gold's attractiveness. After all, since gold is priced in dollars, an increase in the value of a dollar means a decrease in the value of an ounce of gold. Additionally, since people buy gold to hedge against potential inflation, ebbing inflation fears dull gold's appeal. Gero acknowledges that "crude selling off, and OPEC possibly doing nothing about it, helping crude stay weak, is anti-inflationary—so the people that have been looking for inflation haven't really found it." But he adds that "now you're going to see some changes based on all the stimulus in Europe, in China and in Japan." "I'm looking at $1,300 to $1,400 as a closing price one year from now," he said. Back in December 2013, Gero predicted that gold was set to rise above $1,300 in the first quarter of 2014—a call that played out nicely as gold approached $1,400 toward the end of March.